To send money to your account and start lending on October, you have to verify your account. To do so, click on the green button "Verify your Account" on the Activity tab and send us the documents presented below. These are the 3 documents that you have to submit in order to verify your October account. A colour copy of a valid passport. If you are not a citizen of the European Union, a second identity document is required (a colour copy of both sides of driving licence, residence permit). If your ID is in two different files, you can merge them in one by using smallpdf.com. A certificate of residence issued by the municipality. If you are staying with someone, please also attach a two-sided ID of the host and a signed certificate of accommodation. 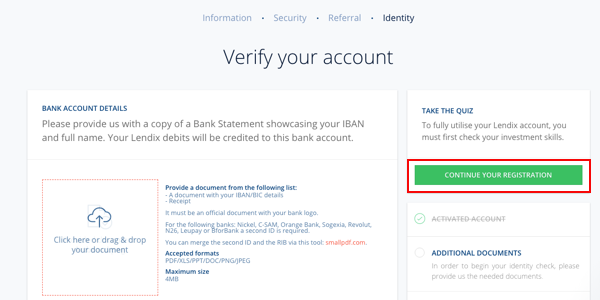 Please send us an official bank account statement in your name with the IBAN you want to link to your October account (for withdrawals). Your bank account must be from the SEPA zone and use the euro currency. After having uploaded your documents, do not forget to click on the green button "Continue your registration" so we can receive and treat your documents. Why do we need to verify your account? We do 3 separate checks on these documents. Through these checks we aim to build a trusted relationship with you and prevent illegal activity on the platform, after all we are a financial platform and subject to financial laws, including anti-money laundering laws.